I saw a dream come true. Years ago, my siblings scratched and clawed an epic 80 foot by 80 garden out of the pygmy and the scrub. The next year, they added an orchard, bringing the whole thing up to a palatial 13,000 square feet. The orchard includes peaches, which is how you make the world’s most expensive peach pie, plums, cherries, Asian pears, and many different kinds of apples, which is how you make the world’s most expensive cider. 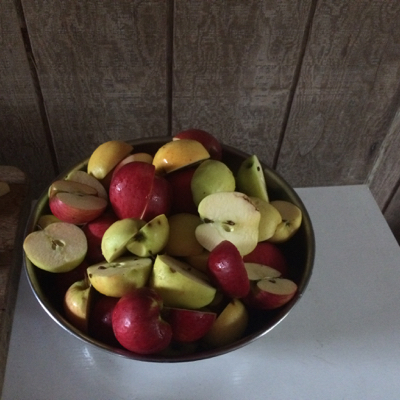 After years of pruning and care, the trees finally produced enough apples to be ciderized. There was some debate about when to pick them. Too early, and there wouldn’t be enough sugar. Too late, and they’d be falling off the trees and/or breaking branches because of the weight of the fruit. Eventually, the day came, and crates and crates were picked by hand. and driven over to Rio’s new estate, which she could not have bought at a better time. 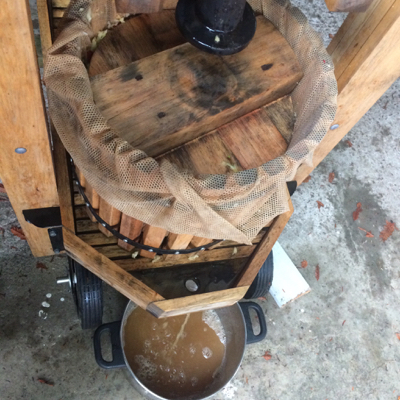 Not only did it provide mountain lion free lodging for Clayton, it also provided the perfect venue for cider making. We took over the studio building with the car port, setting up tables with cutting boards and knives off to the side, and the press itself in the place of honor in the middle. 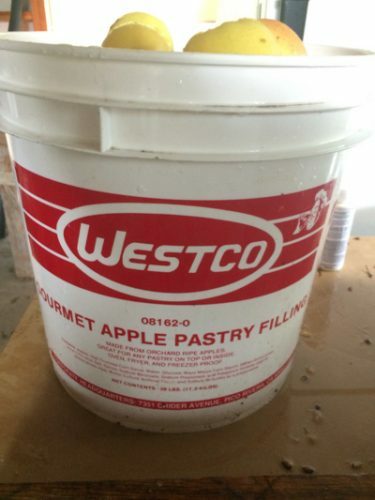 It was sort of gourmet apple filling! It took all day, but we pressed nearly 40 gallons. It was nice to think that we were doing it the same way it had been done for hundreds of years. Jonathan saw it as a tribute to our English ancestry, since cider is such a tradition in our father’s homeland. I often used to drink cider with him at the pub with his old dog Jesse sleeping peacefully at our feet. 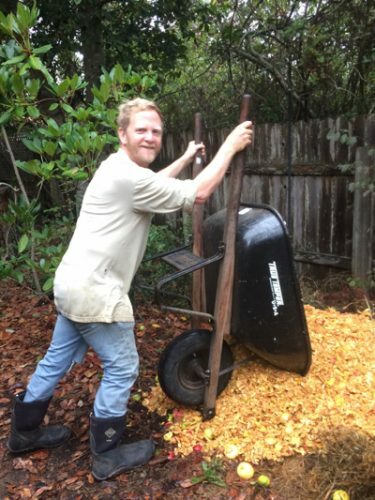 When we planted the orchard, we hoped that one day we would be able to make our own cider from our own apples, and that dream came true on a stormy Saturday, with all of us together, celebrating the past, the present, and the future, all together. A YEAR AGO: Our good friend Paul was here. And I got up close and personal with my buddy, the Moon. 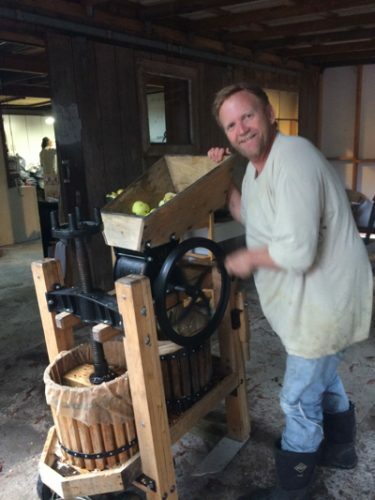 What a nice entry, making apple cider the old way is just fantastic to hear, I’m sure you will enjoy the orchards for many years to come, apples are also my favorite fruit to eat, I have an apple a day. Thanks for the ride Suzy. I’m also sure your cider must be a delight. That is so great. 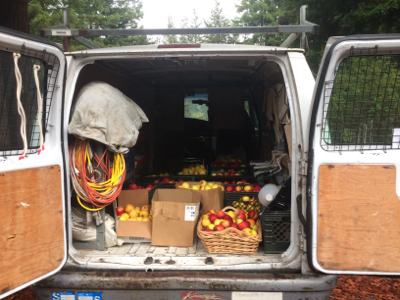 Can I ask how long it took from the planting of the orchard to the picking of the apples? Is it three years, which I’m guessing from the date of your blog entry about the planting? Yes, three years seems to be the minimum, and don’t forget to prune every year. The apples and peaches gave fruit before that, but just not enough for large scale efforts like cider making. The cherry has yet to fruit. Maybe next year! Let me what your Dad plants! I can enjoy from afar! Wonderful story and I hope you all feel a great sense of accomplishment. I certainly can sympathize with the idea of the most expensive cider ever. My first “free” Alaska salmon cost about $15,000. That is one pricy salmon. Was buying a boat involved?